Ensure you are using the right solutions for the conditions that you’re operating in. Ink performance can differ based on the substrate source, printing system and environmental conditions. 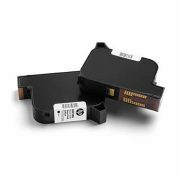 We offer a range of ink products from simple-to-use, snap-in solutions that provide a clean, no-maintenance option for your printing needs to fast, high resolution printing in an ultra-compact form factor. Fast-drying, durable prints that deliver reliability and cost-effective technology to your business.